I'd have to say I was a tad reluctant to switch from using my vexilar this winter, but after some good use I was happy all in all with the MArcum LX-3! Finishing up my hard water season on Buffalo BAy of LOTW, my Marcum was key during a negative bite! The Jumbos and small walleye were really hugging the bottom not coming up more than a few inches to feed! THe separation and fine tuning of the LX-3 enabled me to really get down to the fish and work them in the sometimes called "Dead zone". This is just one example of my satisfaction with the unit! For the most a flasher is a flasher, but Marcum has up'ed it one. MOre power and great fine tuning! 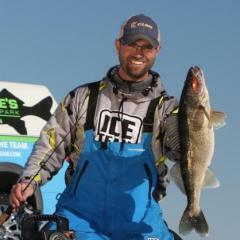 I feel more confident with my future success on hardwater!!! Welcome aboard the MarCum LX-3 Express. Finished year two with my LX-3 without a hitch. Saw an LX-3 on hsolist for $249 looks like new. I'll be finishing my 2nd year with the LX-3 tomorrow on Lake of the Woods. I have to say I'm VERY happy with the performance of this unit. It has definitely helped me to catch way more fish. I ended up getting an LX-3 late in the season after surgery and didn't get a chance to use it. I want to put it on my boat. It will go in the front by the trolling motor. I wanted to put a high speed transducer on the back and run the cable through the boat, but thought the transducer might interfere with my Eagle Optima in the back. Any thoughts whether to put a high speed or a puck on. Thanks. I too would like to use my Marcum LX3 durring the summer in my Alumacraft boat. What do I need and where can I get it? At this time, No it is not compatable with the MinnKota Universal Sonar motors. Just finishing up my 1st. year with my MarCum LX-3 and it has worked flawlessly all winter! 5 to 7 days a week!! If you haven't gotten yours yet now is the time to start looking for sales. A really GREAT fishing machine!! I could fish all weekend with the Vexilar on one charge, but only one day on the Marcum. Ok deal but then you pay shipping. I went to Interstate and they gave me a great deal on the same battery and they will back it up. Plus they are only 1/2 mile away and I like to support locally owned bussinesses when I can. OK! So all you guys switching over to the LX 3, are you selling your Vexilars cheap? Couldn't convince the wife to let me spend the $400+ on the LX-3 so I got the LX-1 for $270 at Thorne Bros. when they had them on special. The Marcum web site says the LX-1 is essentially the same thing as the LX-3 only without the battery indicator, adjustable zoom and soft carrying case. It is an awesome machine and I have fished right next to an FL-18 with it and the separation was far superior. I don't ever want to ice fish without it. I've got to agree with the above comments. I was a little skeptical that this flasher would be that much better than an FL-8. But, my skepticism faded quickly. It was way better. Now to be fair, my FL-8 was an older unit, but the LX-3 outshined even the FL-18 during a couple on-ice comparsions. Not by a lot, but, as Jim said, it is a one-up. The feature I like the most is the zoom. I didn't think I would use it much, but I used it a ton walleye fishing. I was pretty confident that I was seeing all the fish hugging the bottom. Another great perk was being able to fish in bright sunlight. Sure, it faded a bit. But, I could still read it clearly. No doubt, Vexilar will come back next year with an enhancement. And, that's the beauty of competition in the market. We the consumers are the winners. My LX-3 was my most valuable tool out on the ice! An excellent flasher, and it helped me ice a lot of fish this winter. 2 years and very pleased with the LX-3. I wouldn't go on the ice without it. Yup I just sold my FL-8 Pro Pack for $150. I just bought a trolling motor ducer at scheels in st cloud, they also have the high speed ducer. the unit was 60 bucks, but has a bracket and a power cable. as for use through my first winter, I was impressed, mostly how it worked in canada in deep water jiging lakers.